Mike Fedorko was at the helm of Fife Flyers for just a few months, but you could still write a book about his reign. His short-lived tenure came at time when the club was mired in chaos which led, ultimately, to relegation for the first, and only, time in their history. He blew in with a reputation as a disciplinarian, spoke with a directness than made him incredibly quotable, and pushed a beleaguered team to its limits. The year was 1990 and a new decade brought nothing other than dark times. Ice hockey’s Premier League was based on three imports per team. Fife – never a hire ’em fire ‘em team – went through three coaches, seven imports and one massive change of direction as it listed badly from day one. The drama began before the start of the season with the infamous “Night of the Long Knives” which saw Rab Petrie ousted as coach and Jim Anderson quit as GM. In came Milan Figala as coach with countrymen, Lubos Oslizlo and Jaro Korotuicka. Failure to qualify for the Norwich Union Cup knock-out stages saw them gone before the league campaign had started – Flyers went south for their opening double header with just Fera on the ice, and coaching cover from the club’s junior development ranks. In came new imports, defenceman Tim Coughlin and forward Steve Gatzos. The latter had an NHL pedigree, a glorious ‘tache, and one leg brace to keep him skating. He still posted 4+2 in a 9-8 debut win over Cleveland Bombers. They arrived as Rowe and Ruggles took the club to court for alleged breach of contract. On his first weekend in town, he made a point of casually dropping into Bentleys’ nightclub to send a message to the dressing-room. His first training sessions saw him make the team sweat like never before – spectators who used to watch rinkside were told to be quiet while he went about his business. Game night, and his netminder called in sick, Flyers lost, and Fedorko walked into the dressing-room and kicked a hole in the wall. It was left there for many years. A 7-6 loss to Murrayfield Racers in front of 3000 fans saw the team work their socks off, but results, and performances, started to fade and, by November, he’d run out of patience. Fedorko spoke his mind both in the dressing-room and in the media – his one-liners were a gem for every hockey journalist. He was so angry with one performance he suggested the players give their wages to junior development, -and another saw him threaten to draft in a dozen youngsters and some old-timers to shake up the room. If he thought things couldn’t get any worse, he was wrong. The nadir was a horrendous, year-ending 19-8 humiliation at the hands of rivals Murrayfield Racers. It was Flyers’ record road defeat, and, for Fedorko, it was a defining moment. Tired of complaints about ice time, he stood on the bench with a stop watch and iced everyone on 30 second shifts, on and off all night long as the goals piled as high as the scoreboard. Fife fans, who had turned up in huge number, started to walk out after barely 25 minutes. The first ones out at least missed Racers taking the middle period on an harrowing 8-1 scoreline. “I hope they enjoyed the ice time,” he said. Fera and Gatzos hadn’t clicked, and Fedorko rang the changes, moving Coughlin to centre and even chucking local skaters Ali Mackin and John Crombie into the first line. But he also understood their desire to see some passion from the team. After one game where they were roundly boo-ed off, he found out the fans weren’t impressed with the way the team sloped off to the dressing room. The next weekend he made them form a circle in centre ice, stood in the middle and instructed them to raise their sticks to all four corners of the rink. They left to applause, despite another big loss. The dawn of a new year brought no respite. The rink was forced to scotch rumours of closure, and David Kinnaird, chairman of the board passed away. By mid-January Gatzos and Coughlin had gone, replaced by Cahill and Paul Cain, former team mates with Cornwall Oilers in the Eastern Hockey League. Cain, a defenceman, scored five straight goals on his debut against Whitley warriors, Flyers still lost 13-9. 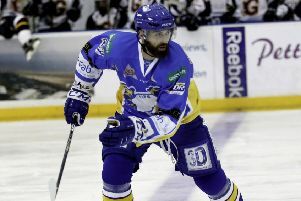 More turmoil came as Fedorko suspended international defenceman, Paul Hand for what he considered poor performances and attitude. One week later, Fedorko was gone. The team could take no more. “ I knew they’d sack me even before they did,” he said. “Look, 75 per cent of the guys phoned the chairman and said they didn’t want to work for me. Chic Cottrell was asked to try to salvage something from the wreckage, but they handed him another import signing in the shape of defenceman, Justin Butorac, arguably one of the poorest ever seen in Fife. The pressure finally came to a head when Rick Fera was thrown out of a game against Durham. Hustled to the sin bin, he exploded, and threw a chair at Wasps’ player, Ian Cooper. He was banned for the rest of the season, and Flyers collapsed in the relegation play-offs. Fera, a man of few words, shone some light on the turmoil that engulfed the club. “It has been a terrible season for everyone, and I feel pretty disillusioned,” he told the Fife Free Press. As the team slid towards its fate, the rink’s directors had to publicly pledge senior hockey would continue. Relegation concluded Flyers’ annus horribilis.